85 days. 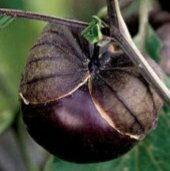 Solanum lycopersicum. Open Pollinated. 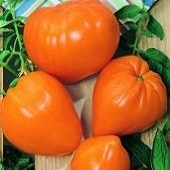 Plant produces good yields of 6 to 8 oz creamy white beesteak tomatoes. They are very sweet, meaty, and flavorful. It is known for its sweet citrus taste that is richer and more complex than many white varieties. It is creamy white inside and outside with few seeds! Add color to salads, and culinary creations, or make a white spaghetti sauce! 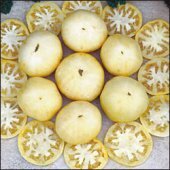 One of the best white tomatoes that they had ever been grown. Always a great seller at Farmer’s Markets! Excellent choice for home gardens and specialty market growers. A heirloom variety dating back to the 1850s. United States Department of Agriculture, PI 270256. Indeterminate.